It’s that time of the year again! No, not the holiday season (though we are getting so close!). It’s time for another round of Swap It Like It’s Hot thrift store makeovers—the brainchild of my friend Charlotte from Ciburbanity! If this is your first Swap experience, let me give you the quick low-down—a bunch of bloggers find $10-$15 worth of random objects at their nearest thrift store or flea market. Then we mail them off to another blogger and she works her magic transforming them into something unexpectedly amazing. Sounds fun, right? 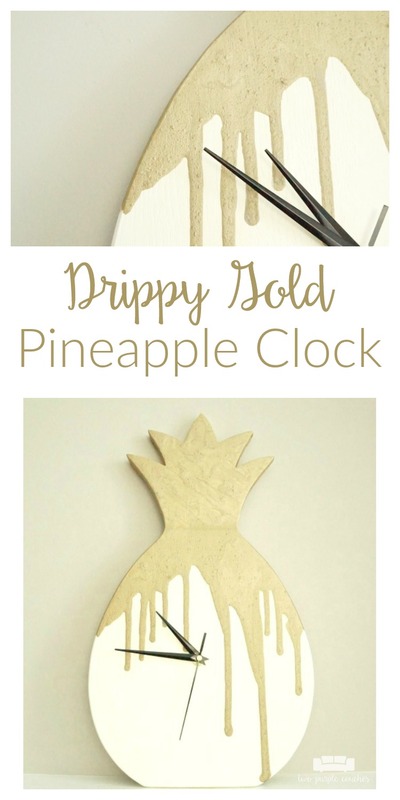 I’m going to share how I turned a wood serving tray into a modern, funky pineapple clock! I kind of love all the brass candlesticks as-is and want to use them to create a fall/Thanksgiving tablescape, and I have a jewelry idea for some of the chandelier crystals, so I moved onto the wood pineapple-shaped tray. 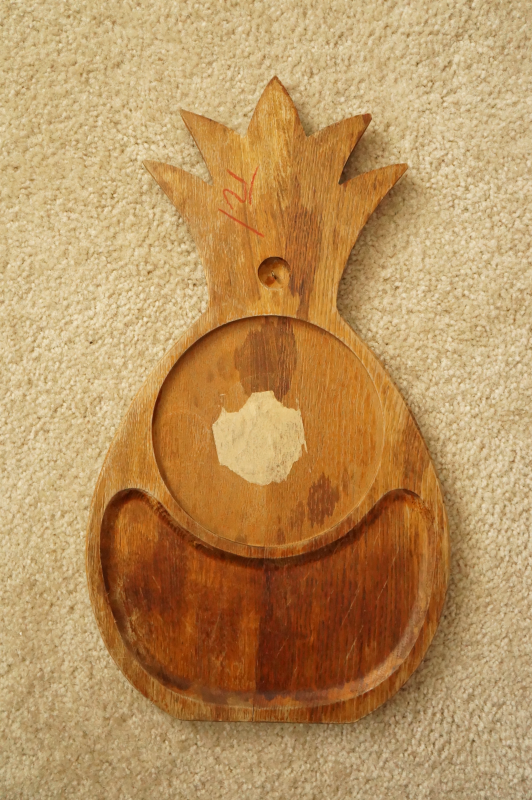 After some brainstorming, I landed on the idea of turning this tray into a pineapple clock. This post contains some affiliate links for your convenience. Click here to read my full disclosure policy. 1.) Paint the pineapple white. 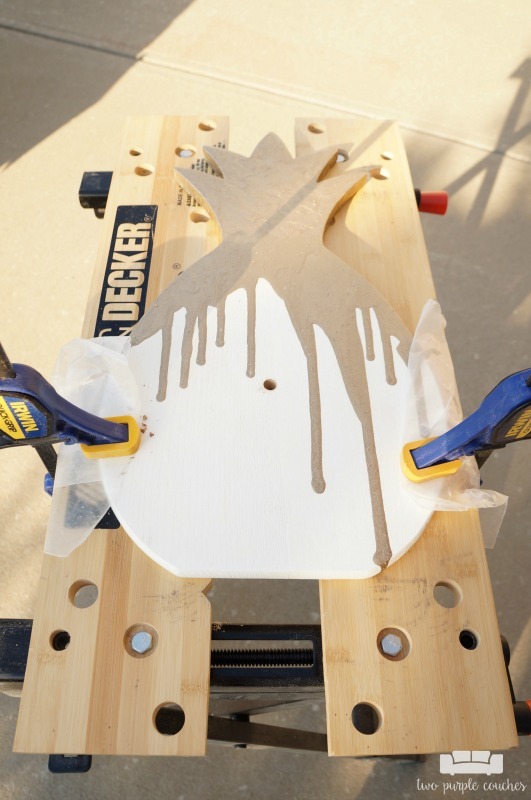 I started off by giving the back of the pineapple a light sanding with 220-grit sandpaper. Then I painted it with 2-3 coats of DecoArt Americana Decor Chalky Finish in Everlasting. After each coat dried, I could see yellow streaks coming through the paint, probably a result of whatever coating was originally on the tray. So then I switched paints and did another 2 or so coats with white FolkArt Multi-Surface paint. I think if I had done a more thorough sanding job on the pineapple to begin with, I wouldn’t have had to do so many coats of paint. Or perhaps I should have started with a primer. 2.) 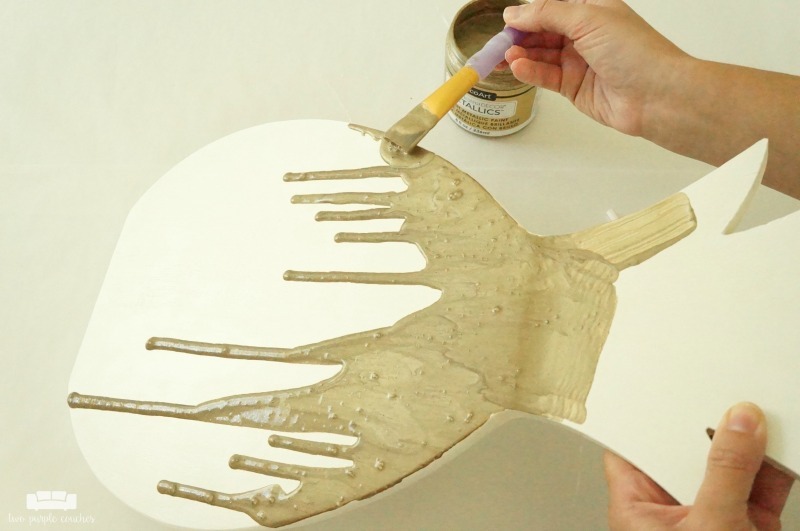 Create a drippy effect with gold paint. 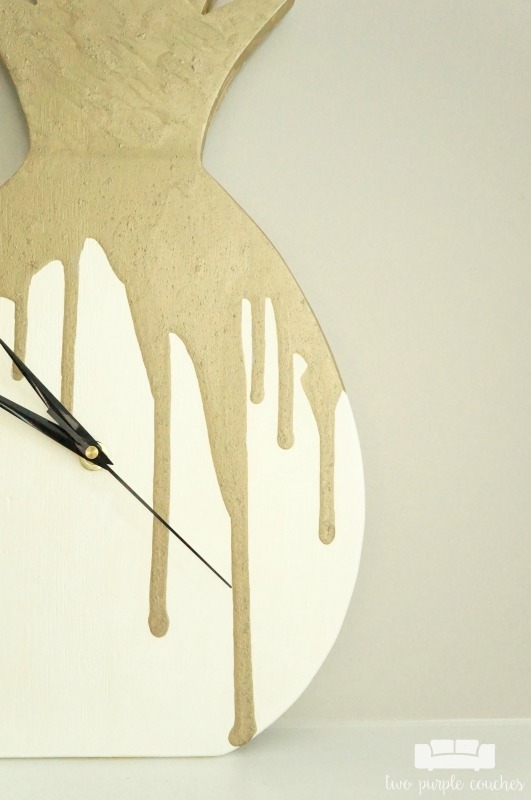 I used DecoArt Americana Decor Metallics in Champagne Gold to create the drippy effect. This is a messy (but fun!) step. I suggest covering your work surface with waxed paper. I loaded the top portion of the pineapple with paint, then slowly tilted it up so the paint would run down the front. I blew through a drinking straw to get the drips going. 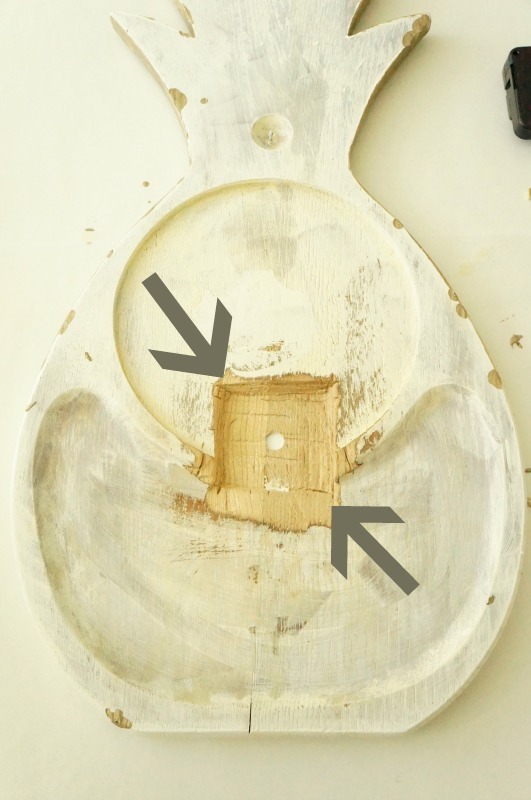 I continued to load my brush with paint and scrape it along the sides, keeping the tray tilted. Once I was happy with the drips, I set the tray down on the waxed paper and added lots of paint to the top portion of the pineapple. 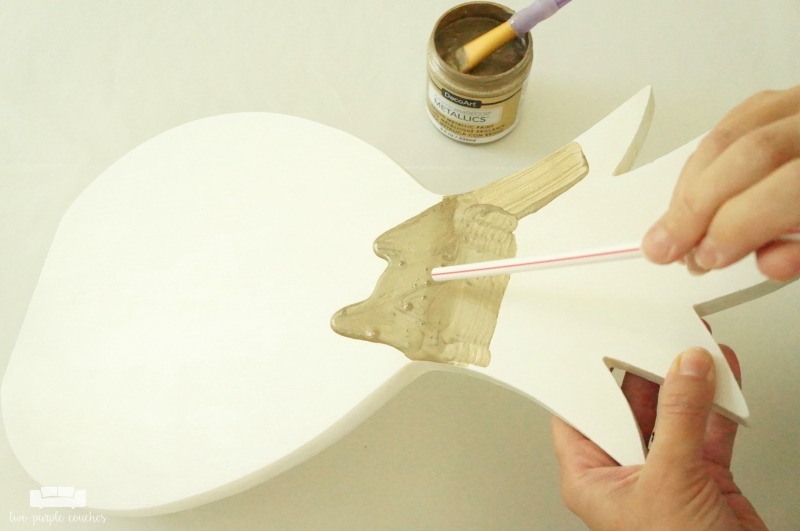 With all this paint, it will need 12-24 hours to dry completely. 3.) Add the clock movement. Don’t be like me—consider the thickness of your clock surface before you get to this step. I used a 3/4-inch paddle bit to drill a hole through the center of the pineapple and then figured I’d add the clock movement, easy-peasy! Not quite. The pineapple was too thick for the 1/2-inch deep movement that I ordered. Instead of ordering another clock kit, I was determined to make this work. So I got out my Makita MultiTool with the plunge saw blade and started shaving off a section on the back of the tray so that the box would fit. The last struggle came with getting the clock movement itself assembled, but after some finagling, it worked! Whew! I think this is my favorite of all my Swap It Like It’s Hot projects, and not only because I finally managed to make it work! 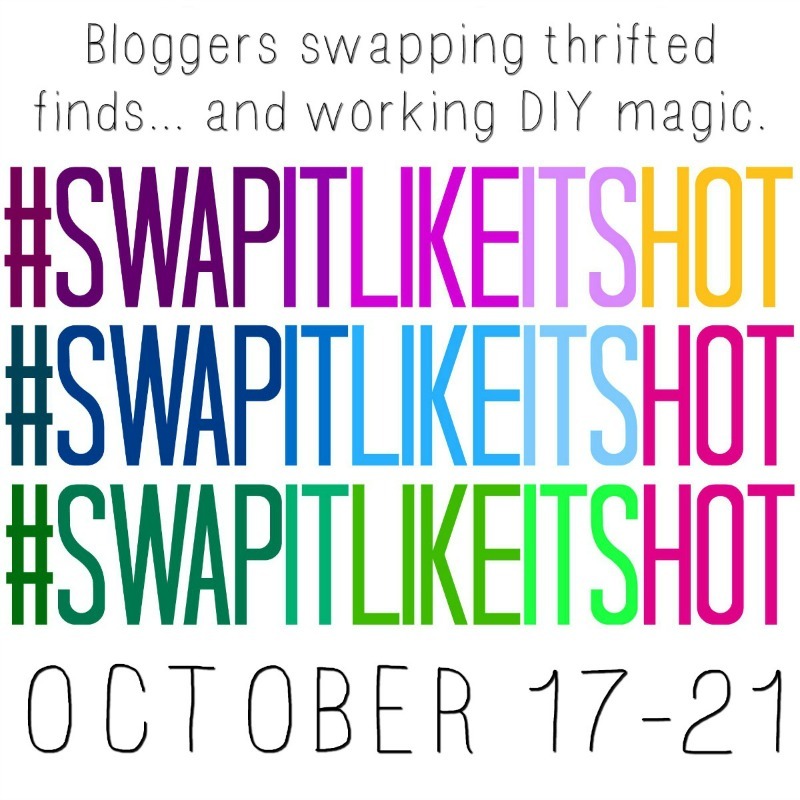 If you’d like to see some of my previous Swap It Like It’s Hot makeovers, check out my posts here, here, here, and here. 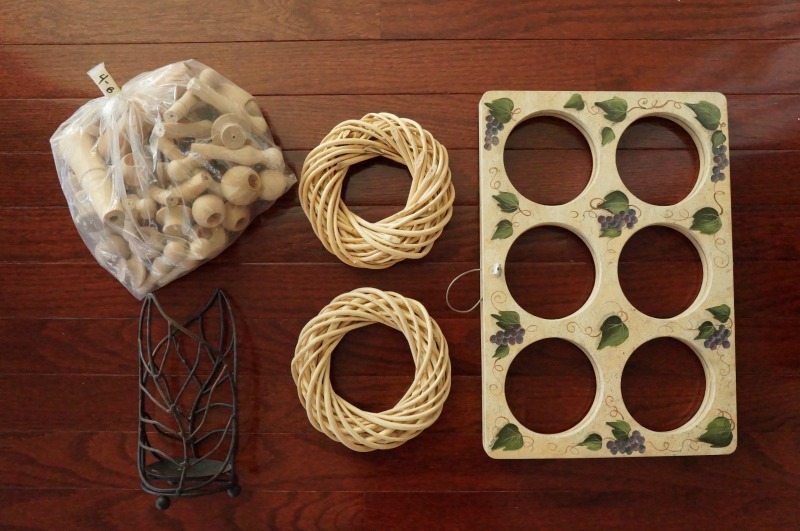 Love this thrift store makeover? Don’t forget to pin it! This entry was posted in Made It Myself on October 20, 2016 by Two Purple Couches. this looks awesome! you really had vision here! This is so fun! I love the drippy paint effect! 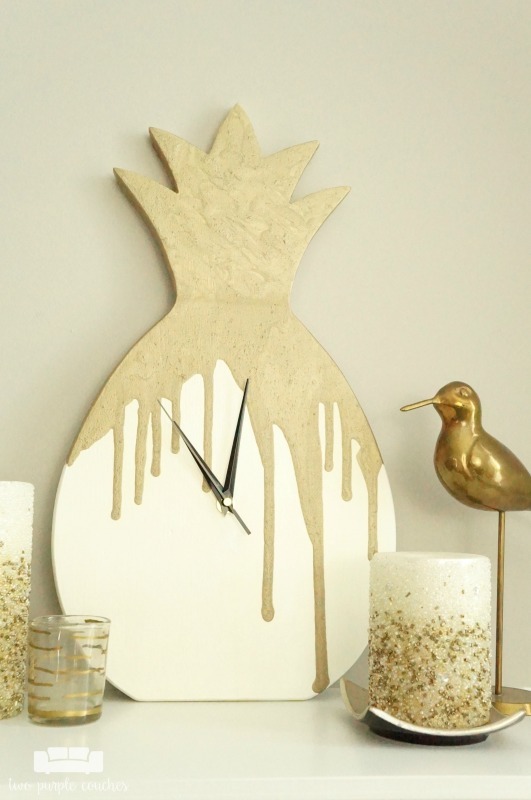 I love how your adorable pineapple clock turned out, it’s like a high end find in a home store! 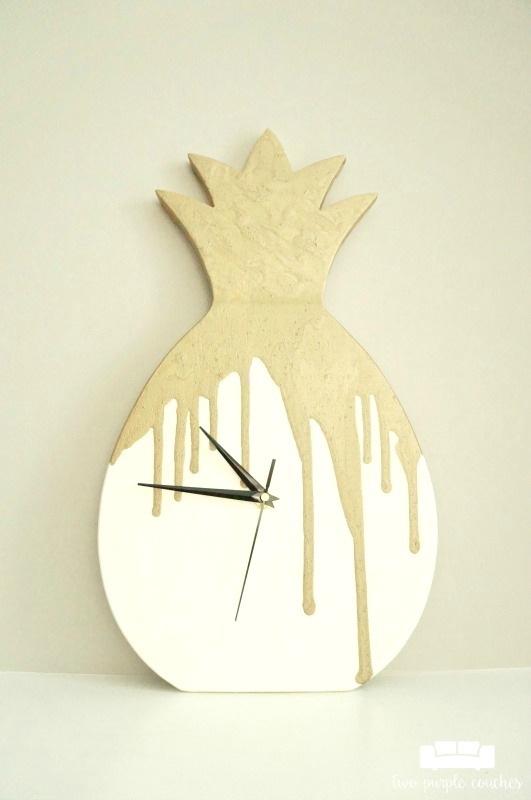 I love, love, love your clock not only because I love gold but I have a thing for pineapples too! And thanks for keeping those beautiful brass candleholders just as they are….cause I love brass as well! Thanks so much Shelly! I’m not normally a brass person, but these candlesticks were begging me not to change them! They just need a good cleaning and they’ll be perfect! I saw your clock this morning and LOVE it! I couldn’t believe Heather sent you so many great candlesticks, but the pineapple is a home run! Thanks so much Charlotte! 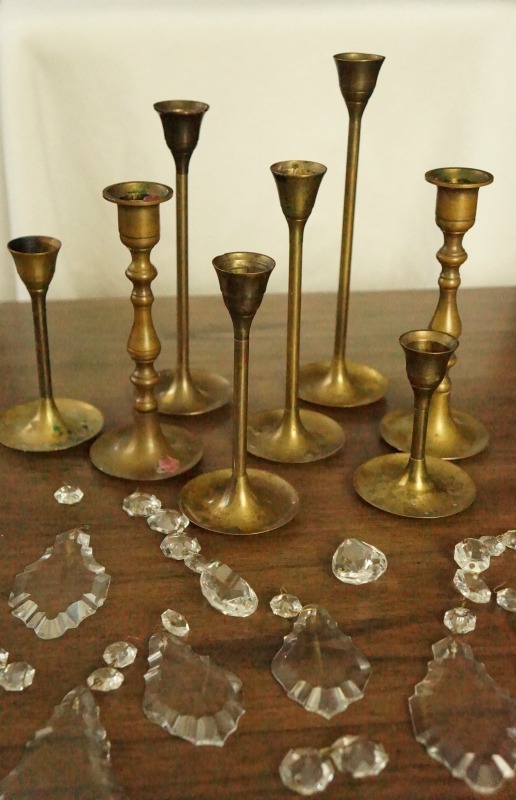 I couldn’t believe the stash of candlesticks and chandelier crystals! They are amazing! Gorgeous!!!! I love anything pineapple related and this is just super cute! Seriously great!! I am so impressed!! Ok I LOVE this! It’s so creative and I am also obsessed with pineapples and gold! Great makeover! Love! The drippy effect is amazing I LOVE the champagne gold color. Nailed it! Thank you Kimm! This gold paint is one of my new faves! I love the pineapple clock! Chic and welcoming! So creative!